We all love games. 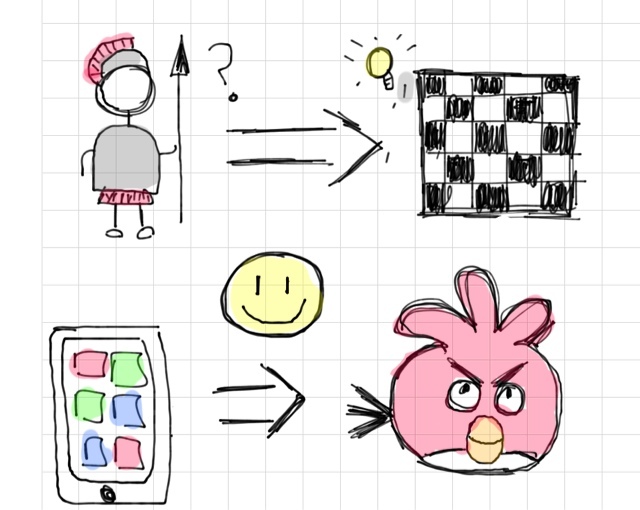 From chess to angry birds, there is a game for everyone of us. Games are as ancient as the human civilization itself, and they have evolved from a useful tool to a small portion of daily happiness. In the past, games were used as a way to learn the art of war, or as Jane Mcgonigal says in his book "Reality is Broken", as a distraction for small hunger periods. But in the end, they all had the same purpose, to make things funnier. But nowadays, games have levelled UP! They are not only something fun, but also a way to socialize and meet people, a new approach to education in schools and universities, a powerful tool for businesses and an upcoming way to change the world. But above all, they make us happy because of the emotions experienced. Now think for a moment what we feel when our favourite team scores a goal, or when we are almost finished with a hard puzzle. What about getting through that difficult level we habe been failing the whole day in Angry Birds? Or what about teaching a guild's member his way in World of Warcraft? So... if we all like games because they are fun and make us happy, can we gamify our businesses to make our customers happier? And the answer to that question is a big YES! This is what gamification and fungineering (Gabe Zichermann, visit his website www.gamificationu.com) is all about. By implementing games in businesses, we carn turn a product or service into a fun experience!. Happier customers show higher rates of engagement, a better perception of the brand, and a sense of being part of something bigger than themselves. Moreover, in highly oversaturated markets, gamification is a great tool for differentiating our company from the others. But gamification has a further scope, it can not only improve bricks-and-mortar businesses, websites or applications, but it also creates better work environments, better places to live in, or better solutions to the world's biggest problems. This blog is about games and business, it is about gamification dynamics, mechanics, and game designing. We will talk about online and offline gamification, the leading companies and examples of the gamification world, or how to improve our strategy learning from the best games.